In today’s film landscape, we are exposed to countless awe-inspiring special effects showing sculpted celebrities in too-good-to-be-true settings discussing life flawlessly and inadvertently though the trials and tribulations of their individual character’s lives. Such films focus on why and how things happen; never placing the blame on certain people or scenarios, but for the most part, many of these stories become disposal, at best. Luckily, every now and again, there are artists who push beyond popular molds and constructs; they are the artists who breathe new life into films, true auteurs. At Eternity’s Gate, starring Willem Dafoe and directed by Julian Schnabel, is one of those special artists and films. Schnabel parts his focus from the nature of why and how things happen, towards the feeling one gets when things do. He seems to find delight in things that cannot be explained. 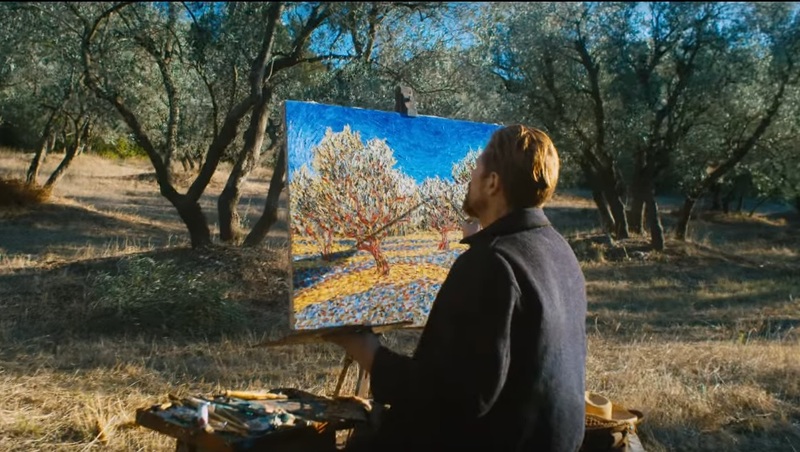 Gate is a film about Vincent Van Gogh, played brilliantly by Willem Dafoe, as he lives out his final tumultuous days in France struggling to find peace and solace in a hostile and rapidly developing world. The film opens in Paris as Vincent fights to paint his way out of a world awash with people who dress and think in the same aristocratic manner. Yet, as much as this is a biopic of the late great painter, it is by no means formulaic, or paint-by-numbers. As Vincent exhausts his visions in Paris, seeming to be too mechanically grey, Vincent meets the infamous Paul Gauguin, who encourages Vincent to “head south” because “the light is better there”. As Vincent makes his way south, the entire pallet of the film begins to change. Mr. Schnabel has an impressive way of stimulating the audience’s senses as he thrusts his viewers into an artist’s perception, whether it be into the mind of a madman or not, is to be determined. With masterful use of camera techniques, color, and sound, we are able to embody Vincent and see the world the way he envisions it. Dafoe communicates the clear message of art being Vincent’s utopia; his Eden from the blunt, and greyscale world. We feel his artistry grow as he walks through rough and open landscapes filled with beautiful instances of nature, but also harrowing depiction of baroness. Mr. Schnabel and his cinematographer, Benoît Delhomme, fill the frame with lush greenery and the most vibrant and golden yellows, but also show us a terrain of earthy tones and neutral views. As the colours and seasons change, the story of Vincent is propelled through the use of Tatiana Lisovskaya vibrant, lush and organic score. Her long ballads of drawn and aired out piano keys are fitting for Dafoe’s chiseled and cracked face, creating a seamless fluid strokes of cinematic brilliance. There is an extensive use shaky cam shooting style which adds to the raw and natural feel that the film embodies. Mr.Schnabel also constructs shots that are drastic and dramatic, adding to the feeling of anguish that Vincent emits throughout the film. While we generally weren’t aware of Vincent’s mental ailments, Vincent decent into madness was a reflection of his dissatisfaction with the world. as well as his experiences within it, therefore painting onto canvas, and finding the beauty in life. Some could even argue that painting was his sole motivation to live, as he could only live. The erratic camera behavior is crucial in capturing Vincent’s manic genius and the film’s organic aesthetic. Mr. Schnabel and Mr. Delhomme utilize extreme Sergio Leone-style close-ups transforming the stellar cast’s faces into canvases as you catch yourself studying each of them as if carrying an easel. The close-ups are contrasted with ultra-wide angle shots with magnificent one takes and wide screen tracking shots. Vincent was a master at capturing the natural world and these shots provide the time and scope to appreciate just that. The director’s brilliant use of color is one of the highlights of the film. Being used as a type of mood ring that helps us understand Vincent’s mental state, Mr. Schnabel utilized numerous techniques with his lens to give the audience emotion. Schnabel use of lens blurring, depicting the imperfection of vision, as sunlight and small angel furs floating through the country breeze, gives the audience a sense of truism to Vincent. While we can all appreciate that Vincent was well ahead of his time, it resonated deeply with me how this message during times of misunderstanding and constant tests of self-worth, At Eternity’s Gate is a testament to the passion and power of art. Vincent’s fellow painters and people in the society of Arles, France, where the film concludes, ignore his brilliance. Vincent’s methods and habits perplex the public as they discarded the artist due to their inability to follow the popular formula for paintings during this era. While Vincent’s paintings consisted primarily of portraits and paintings based on realism, Mr. Schnabel sums up this tragedy of being ahead of your time as somewhat of a curse and a gift, for a tormented character and odd soul. While Schnabel decorates his film with scenes of immense poignancy, including a scene where Vincent is seen laying in a coffin appearing to be dead, juxtaposing idea of how genius and talent can only be appreciated only after death. At Eternity’s Gate is a stunning mark of artistry. Director Julian Schnabel utilizes an arsenal of brilliant cinematic techniques, carefully placed scenes and powerful camera work to helm one of the most memorable biopics in recent years. It becomes clear both in physical form and embodiment that Dafoe was always born to play the late tormented artist, in a role that could easily earn him a nomination and perhaps a win at this year’s Oscars. Let’s just hope that, if he doesn’t win, both his ears stay intact. Night Film Reviews: 8 Out of 10 Stars! What did you think of At Eternity’s Gate? Marvellous masterwork or too much of a stuffy art film? What did you think of Director Schnabel’s look at Van Gogh? Paint us a picture and leave your thoughts below!